Turnberry’s famous Ailsa course was announced today as the venue for the 2015 Ricoh Women’s British Open for only the second time in the Championship’s history. Turnberry, the Luxury Collection Resort in Ayrshire and host of the Open Championship on four occasions, was the scene of the Women’s British Open Championship in 2002 when Australia’s Karrie Webb won this prestigious title for a third time. 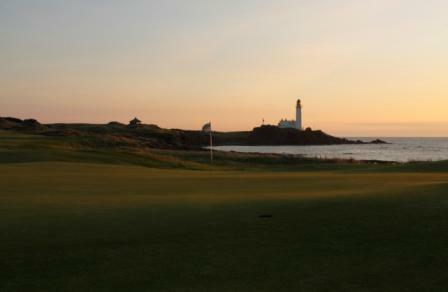 The stunning location of the Ailsa course makes Turnberry one of the most scenic golf destinations in the world. A top-quality links, the Ailsa course was the scene of the 1977 Open Championship and provided the stage for the famous ‘Duel in the Sun’. In brilliant sunshine, Jack Nicklaus and Tom Watson went head-to-head over the final two days, with Watson eventually finishing a shot clear of his rival — and 11 shots ahead of the rest of the field. Turnberry also hosted the Open in 1986 (Greg Norman) 1994 (Nick Price) and more recently in 2009 (Stewart Cink). Webb’s triumph at Turnberry in 2002 saw her open with a stunning first round 66 and close the tournament out with the same score. She came from three strokes back in the final round to clinch victory with a flawless final round over the Ailsa Course. In winning, she became the first player to win the Championship three times. Webb, who has won over 50 international titles in her illustrious career including seven Major titles and is currently ranked World Number 6 on the Official Rolex Rankings, commented, “I am really pleased to hear that the Ricoh Women’s British Open will be returning to Turnberry. I have wonderful memories of winning the 2002 Championship and I can’t wait to return in 2015. Turnberry is one of the best courses I have played so I hope I can continue on from where I left off in 2002! The 2015 event will see the Championship played in Scotland, the Home of Golf, for the third time in five years following Carnoustie in 2011 and St Andrews this year. Scotland’s regular hosting of the event is part of a 10-year investment by EventScotland which will see the Championship played in the Home of Golf every second year until 2019. Prior to Turnberry, The Royal Birkdale Golf Club will host its sixth Women’s British Open in 2014, continuing a strong association with the event that goes back to 1982 when Marta Figueras-Dotti took home the coveted title. The Championship returned in 1986 when England’s Laura Davies triumphed. Sophie Gustafson won in 2000 and five years later Korea’s Jeong Jang claimed her first professional victory by defeating Gustafson and another Korean, Young Kim, by four shots on 16-under par 272. In 2010 Yani Tseng, Number One on the Rolex Rankings, came out on top. The 2014 Ricoh Women’s British Open will be played 10 – 13 July and is showcased, as always, on BBC Television and around the world. The Ricoh Women’s British Open was founded by the LGU in 1976 and is staged in conjunction with IMG, the world’s largest sports marketing company. The event has been co-sanctioned by the LPGA and LET since 1994 and gained Major status in 2001. Ricoh, the leading technology provider of Managed Document Services and Production Printing, has been the title sponsor of the Ricoh Women’s British Open since 2007.